If you thought it’d take at least $1 million to buy an apartment along the Brooklyn Bridge Park waterfront, here’s something that’s (a little) cheaper. Unit #306 at 360 Furman Street–aka One Brooklyn Bridge Park–is the cheapest unit up for sale currently in the building, asking $895,000. At that price point, it doesn’t look like you’re getting views of the water or Lower Manhattan. 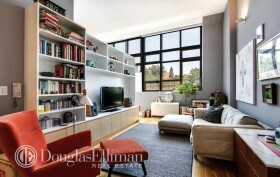 But you still get a decent amount of space and a pretty cool, custom-designed storage system. 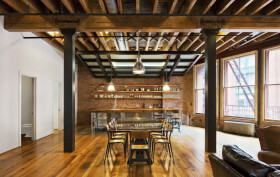 Located on Franklin Street in Tribeca, the interior of this loft, by designer Jane Kim, is a cool combination of rustic elegance and industrial modernism. The wooden floors and brick laid walls warm up the expansive space that’s somewhere between urban loft and mountain ski lodge. If you happen to be one of those New Yorkers charmed by the use of raw materials and luxury amenities, this might be the perfect bit of inspiration for your next home makeover. In an endless attempt to maximize space in tiny New York City apartments, the lofted bed has become a popular mechanism. This usually consists of a mattress hoisted up on wooden supports, leaving just about a foot of space below the sleeper’s head and the ceiling. But in a beautiful Tribeca loft renovation, Jane Kim Design masterfully tackled this issue by lifting the entire bedroom volume only slightly off the ground, encasing it in an architectural glass cube, and installing cabinetry, bike storage, HVAC, and a washer/dryer beneath.